In June 2012, the Governmental Accounting Standards Board (GASB) issued Statement 68, Accounting and Financial Reporting for Pensions. The GASB also issued Statement 71, Pension Transition for Contributions Made Subsequent to the Measurement Date (amends GASB Statement 68). These statements amend the financial reporting requirements of GASB Statement 27 and are effective for years ending in 2015 and after. This guidance focuses on local governments participating in the State of Washington cost-sharing, multiple-employer pension plans. However, the concepts are also applicable to single employer plans. This guidance is intended to assist local governments in the application of the new pension standards. Local governments must apply their own professional judgment to determine if this guidance is appropriate for their facts and circumstances and must draw their own conclusions about the proper application of the new pension standards. Entity management is solely responsible for the content of the financial statements. Each local government is responsible for evaluating the information used to recognize and disclose pension amounts in its financial statements. Preparers must understand the underlying accounting and reporting concepts for pensions and retain adequate supporting documentation for all amounts reported. These changes are limited to the government-wide and proprietary fund statements and do not impact the modified accrual, current resources focus of the governmental fund statements. Much of the financial data necessary to apply GASB Statement 68 will be obtained from the State Department of Retirement Systems (DRS) at www.drs.wa.gov. Download the Participating Employer Financial Information (PEFI) report from the Employers section of the website. This report is published annually, as of June 30. Employer Allocation Schedules: Each separate plan presents a schedule of employer allocations. The schedules are sorted by allocation percentage, largest to smallest, and you will need to search each schedule for your local government’s name. Note that the PERS 1 and TRS 1 schedules have separate sections for both the regular allocation and the Plan 1 UAAL allocation. You will need both allocation percentages. If you have more than one DRS ORG ID number, you will need to combine the allocation percentages. Under RCW 41.45.060, part of the contributions for PERS 2/3, SERS 2/3, PSERS 2, and TRS 2/3 are contributed to PERS 1 and TRS 1 to fund the plans’ UAAL. Employers have a responsibility to exercise due care in financial reporting and to verify and recalculate amounts specific to them. Use the DRS eServices Contribution Reconciliation system to verify the reasonableness of contributions used in the calculation of your proportionate share percentage. Note that the DRS calculates contributions based on the process date (the day after the transmittal date), not your reporting date. This may cause minor timing differences between your accounting records and the DRS. Schedule of Collective Pension Amounts: The PEFI also includes the schedules of collective pension amounts for each plan. Employers will use the collective pension amounts and apply their proportionate share from the employer allocation schedules to determine their own share of pension amounts (i.e., net pension liability, deferred inflows/outflows). The use of this schedule is further disclosed below. On the statement of net position, local governments will report a net pension liability or asset, deferred outflows and deferred inflows for the State plans in amounts that are measured as of June 30, (the measurement date). There is no need to “roll forward” these numbers to the employer’s reporting date. This is a concession made by the GASB to accommodate timely financial reporting. If the measurement date was required to be the same as the financial statement date (the reporting date) it would be difficult for local governments to produce timely financial statements. The earliest measurement date that can be used by an employer is one 12 months earlier than the reporting date. Therefore, local governments with a reporting date of June 30, 2017 can use either the June 30, 2016 schedules or the June 30, 2017 schedules for their year-end balances. Local governments with a reporting date of December 31, 2017 will use the June 30, 2017 schedules for their year-end balances. See Sample Illustrations for PERS 1, PERS 2, PSERS 2, LEOFF 1, and LEOFF 2 on the GASB 68 Pension Worksheet. For each plan in which you participate, multiply the amounts in these schedules by your unique allocation percentage to calculate your entity’s share of each plan’s pension liability, deferred outflows and deferred inflows. Note that the percentages reported in the employer allocation schedules are percentages, not simple decimal amounts. LEOFF plans 1 and 2 include a special funding situation in which the State has a legal obligation to make contributions directly to the plans. Although the State makes the contributions, individual employers are required by GAAP to recognize pension expense and an equal amount of revenue for their share of these contributions. LEOFF 1 is fully funded and there have been no contributions since the year 2000. LEOFF 2: The total amount contributed by the State appears in the PEFI at the end of the LEOFF 2 Employer Allocation Schedule. Note that allocation percentages have not been calculated for individual employers and each individual employer must calculate their own share of the State’s total contributions. Formula: From page 123 of the 2017 PEFI, State of Washington special funding allocation percentage (39.345464%) divided by total State of Washington employer allocations (60.654536%) = 64.868131%. Example as of June 30, 2017: $883,410 (employers LEOFF 2 contributions) x 64.868131% = $573,052. Employers will also use this allocation percentage to calculate the State’s proportionate share of the net pension asset associated with the individual employer for their note disclosures (a requirement of GASB Statement 68, paragraph 80). Example as of June 30, 2017: $7,760,092 (employer’s LEOFF 2 asset) x 64.868131% = $5,033,827 (State’s proportionate share of the net pension asset associated with the employer). Contributions are no longer made to LEOFF 1 and so employers need only disclose in the notes the State’s proportionate share of the net pension asset associated with the employer. Formula: From pages 112 and 113 of the 2017 PEFI, State of Washington special funding allocation percentage (87.12% divided by total State of Washington employer allocations (12.88%) = 676.397516%. Example as of June 30, 2017: $2,066,074 (employer’s LEOFF 1 asset) x 676.397516% = $13,974,875 (State’s proportionate share of the net pension asset associated with the employer). Under GASB Statement 68, annual pension expense is no longer the cash contributions made to the plans. Contributions are a reduction of the pension liability. GASB Statement 68 does not change statutory contribution rates or cash flow and we recommend that you do not change the way payments to the DRS are recorded in your accounting system. You may want to consider the use of a “contra” account in your accounting system to accumulate all of the debits and credits to pension expense that result from GASB Statement 68 journal entries. The GASB Statement 68 permits the measurement date of the collective net pension liability used by a cost-sharing employer to be as of a date no earlier than the end of its prior fiscal year (i.e., 12 months earlier). Entities with a year end of December 31, 2017 will use the DRS PEFI report for the fiscal year ended June 30, 2017. Use your 2017 allocation percentages and the 2017 Schedules of Collective Pension Amounts to calculate your end of year amounts for each plan. The illustrations show the beginning and ending year pension related balances, journal entries and GL account detail for an entity with a December 31, 2017 year end. You must perform these calculations for each plan in which you participate. Note for local governments with a June 30 year end. These instructions assume that entities with a June 30 year end will use the June 30, 2016 PEFI and defer contributions from July 2016 through June 2017 (12 months). However, you have the option of using the June 30, 2017 PEFI with no deferral of contributions, if available in time to meet your SAO reporting requirements. Once a measurement date is selected (current vs. one year prior) local governments should not switch back and forth between the two dates over the years. This would be a change in accounting principle that would require a restatement of prior periods. When making your selection for the measurement date, keep in mind that there is no guarantee the current year’s PEFI will be available by your annual report deadline. Local governments will use their allocation percentages to calculate their individual proportionate shares of these deferred outflows and inflows. They will be amortized over the recognition periods published by the DRS in the PEFI. GASB Statement 71 requires an employer’s contributions subsequent to the plan measurement date and up to the end of the employer’s reporting period to be reported as a deferred outflow of resources. State of Washington plans have a June 30 measurement date. Employers with a December 31 year end will defer the last six months of contributions. Due to the timing of the plan’s financial reports, employers with a June 30 year end will defer 12 months. These amounts are reversed in the following year when the new year-end amounts are deferred. For your calculations, use actual contributions to the plans. Contributions from PERS 2/3, SERS 2/3, and PSERS that go to PERS 1 should be reported as PERS 1 contributions. Changes in proportionate share and differences between actual employer contributions and proportionate share of contributions – amortized over the average expected remaining service lives of plan participants (amortization period provided by the DRS). The DRS uses actual contributions to determine proportionate share, and so differences between actual employer contributions and the proportionate share of contributions is expected to be rare. However, an employer’s proportionate share of each plan’s collective liability and deferred outflows/inflows is expected to change each year. The effect of that change should be calculated at the beginning of the period. Under GASB Statement 68, if there is a change in proportion of the collective net pension liability since the prior measurement date, the net effect of that change on the employer’s proportionate shares of the collective net pension liability and collective deferred outflows of resources and deferred inflows of resources should be recognized in the employer’s pension expense, beginning in the current reporting period, using a systematic rational method over a closed period (expected remaining service lives). The DRS will maintain and publish the amortization schedules for the collective deferred outflows/inflows (see the June 30 Participating Employer Financial Report). Individual employers must maintain their own amortization schedules for the deferred outflows/inflows that result from the changes in proportionate share. Note that the PERS 1, TRS 1, and LEOFF 1 have a recognition period of one year, as of the beginning of the measurement period. As a result, all changes in proportion for these plans are expensed in the current year with no need to amortize. 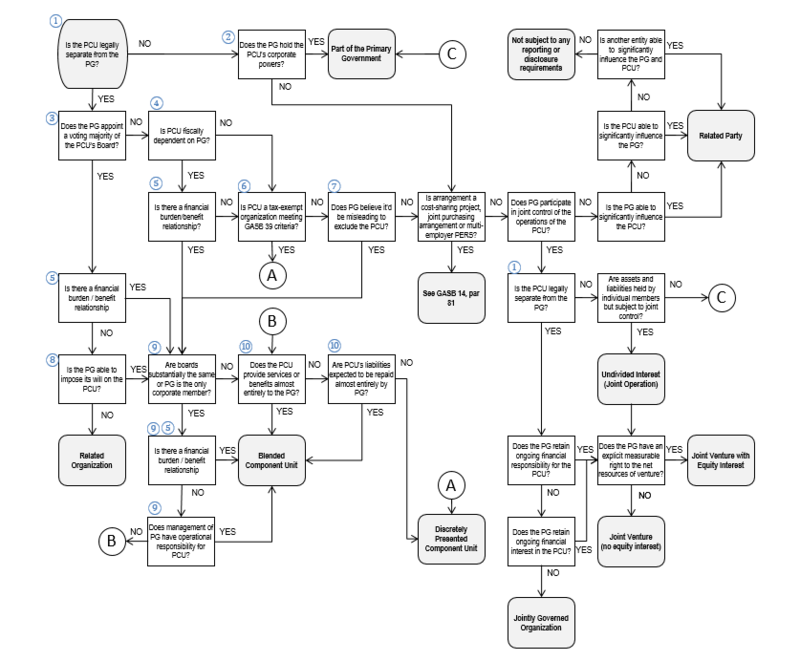 See Sample Illustration of the calculation of changes in proportionate share and amortization schedules on the GASB 68 Pension Worksheet. The provisions of GASB statements need not be applied to immaterial items. Governments may consider adopting an amortization threshold for their deferred outflows/inflows related to pensions. For example, amounts less than $500 could be expensed in the current year rather than amortized over many years. GASB Statement 68 does not mention specific requirements for allocation of pension-related amounts to individual funds. 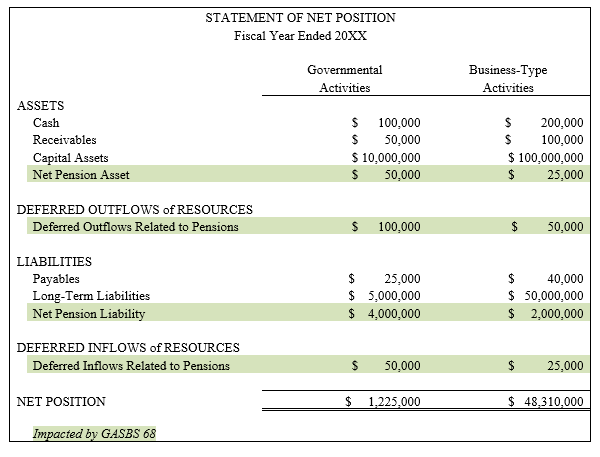 However, basic governmental accounting principles (see GASB Statement 1, Authoritative Status of NCGA Pronouncements and AICPA Industry Audit Guide, paragraph 42) require that long-term liabilities that are directly related to and expected to be paid from proprietary-type funds be reported in those funds. Many local governments with a PERS 1 liability do not have PERS 1 employees. We recommend you use your PERS 2 contributions to make the allocation. Other methods may also be acceptable based on individual facts and circumstances. 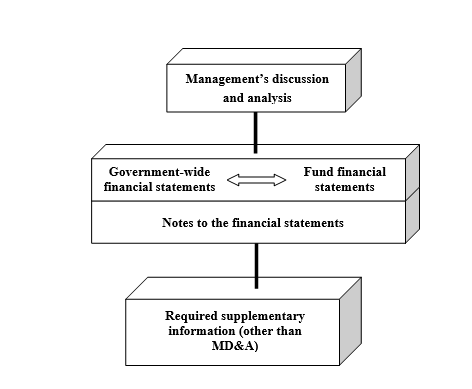 The allocation methodology used by the local government should be disclosed in the notes to the financial statements. 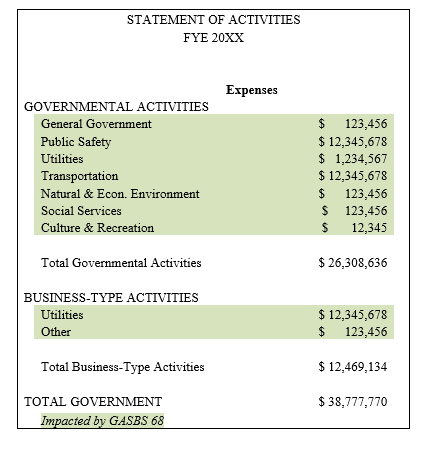 In the statement of activities, pension expense for governmental activities should be further allocated by function. Pension liability, deferred outflows/inflows, and pension expense should be reported in each applicable proprietary fund. Note disclosures and required supplementary information (RSI) required under GASB Statement 68 are available on the SAO website. The RSI schedules of employer contributions should report the amount of contributions recognized by each pension plan. Contributions from PERS 2/3, SERS 2/3, and PSERS 2 that go to PERS 1 should be reported as PERS 1 contributions. Covered payroll is the payroll on which contributions to a pension plan are based (ref. GASB 82, par. 5). Note that for PERS 1, covered payroll from PERS 2/3, SERS 2/3, and PSERS 2, should also be included in this calculation. Note that the RSI schedules have two different measures of covered payroll. The Schedule of Proportionate Share of the Net Pension Liability is dated as of the plan’s measurement date (6/30 for state plans). The Schedule of Employer Contributions is dated as of the employer’s year end. In cases where these two dates are different, the amounts reported for covered payroll will be different.